The other one haven't updated yet. yeah..i know about the other group has password protected..i dont have the password but luckily i managed to watch it thru B*****r (u know)..U should try it..
Did you guys already had a name for this couple? @ororomunroe, I can't find the Date Sp episode online, maybe u can pm me the site. Thks. @briseis, tq for the latest preview vid, I love that little kid(Kokoro) so cute. I really want Junko to realize who loves her most and choose him(Takane), not Kiyomiya whom she had a crush on. And with Amane in the mix, expecting to see some jealousy from Takane too, especially his facial expression that he tried so hard to maintain. Can't wait for new episode!!! @briseis , thanks for the video preview. This little boy is beyond cute, love listening to him speak English. I wonder what happened that drives Junko to drink? Is about time she starts missing him, ahhhh....so happy, rejoice ! 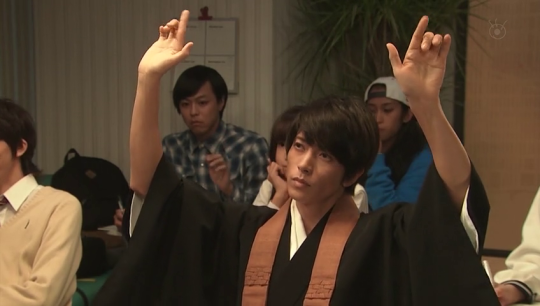 @fidda868 nope, I have not watched subbed Ep 6 yet, hoo hoo...!! The desperation of waiting for subbed vids always made me want to learn the language properly rather than understanding their conversations bits and pieces of it. I wish someone would sub all the vids relating to this drama- bts, preview etc. 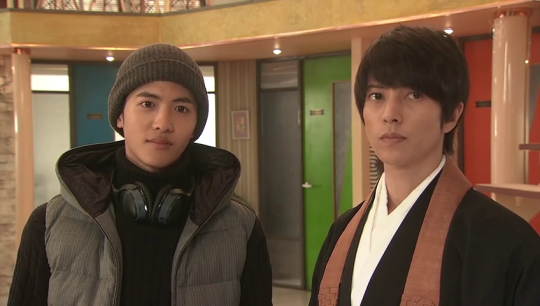 Also the written letters or captions in the drama, wish it was translated too. Anyway, I really appreciate the translators effort to do it though not as fast as korean dramas. Thanks for the cute comic strip of Sankyu @Ahpheng, My daughter and I love him since the beginning and we saw him in Otona No Kiss Eigo ep.55, learning English pronunciation using Siri with Yamapi. Yamapi is quite good in his conversational English and can't wait to see his nx episode where he will meet his on-screen in-laws for his show. Seeing him wearing modern clothes felt strange, . Tskkkk..gonna get a diabetes after watching these couple!! I dunno how to put under spoiler...gomenasai..
Omgggg...tq @fidda868, I almost had a heart attack out of my excitement to watch ep 7 soonnnn....! Hopefully it was not a dream coz I'll faint!! Yesss, now I can sleep n wait till the raw vid uploaded tomorrow, arigato gozaimasu. let's do a little dance...yay! @Ayu Rashid you're welcome. 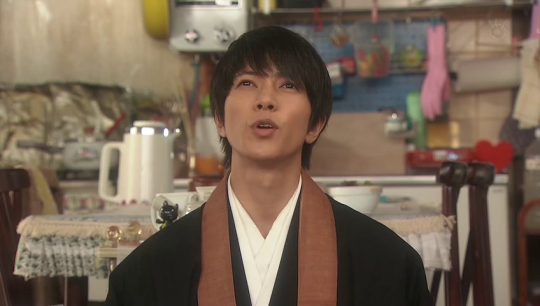 sankyu-chan is the cutest, i enjoyed all his scenes. I knew it!! Wishing too much for a bed scene when they can't even kiss peacefully without being disturbed... Anyway we get some positive development with the otp and nx episode will be interesting too.....Takane expelled from temple? At this juncture, am still not sure if Amane really want to follow his grandma's order to threaten Takane's position n break-up his relationship with Junko or will he help his brother instead while playing along with grandma's scheming. Just marry Kaori already, poor girl can't catch her break. Huwaaa... Now hv to wait another week again!sob sob* I'll just entertain myself by watching the episode again and making collages later. This show makes me so happy and I can’t believe that it will end in 4 weeks! What am I going to do with my life without it?! Now, that Takane is pretty much disinherited and his grandmother doesn’t want to hear his apology he moves in with Junko’s family! I mean this just makes it official since he’s pretty much lived there. Cohabitaton hijinks! They are pretty much playing marriage! Junko’s and Nene’s room turns into the cheesiest couple room ever since ISWAK (there are pillows with their initials and a huge couple photo of them above Junko’s head). They will sleep next to each other while holding hands, Takane turns into a housewife (and wearing an apron!LOL!) (He even asks for a goodbye kiss and when he gets it he becomes dizzy!!!) while Junko is the career woman and she also becomes livid with jealousy when she finds Kaori’s lipstick on his monk robes (I’m not Kaori’s greatest fan but I wouldn’t wish marriage with Takane’s rat of a brother even to my greatest enemy, but at least she will know what it is like to be forced to marry someone you don’t love and perhaps she will reflect on that). MY FEELS! COUPLE SCARFS!!! AND WITH THEIR INITIALS TO BOOT! I’m not sure since the written doesn’t mention it but it looks like something will happen to Junko’s dad and that’s why they are in the hospital. HOW PERFECT WAS THIS?! THIS OTP OWNS ME! How poignant was it that it was Junko who offered Takane her hand, holding it out and open for him to take it, and that she’s finally able to acknowledge and appreciate his help and openly admit and express her gratefulness to him? How perfect was it when she suddenly intertwined her fingers with his?! Suddenly, the polite gesture turned into something much more intimate and profound, something so intimate and personal. And despite his suprise Takane’s first reaction was to instinctively entwine his fingers with hers without any hesitation! The sheer intimacy of that touch was even reinforced by the fact that they’re holding them behind their backs where no one else could see them, hidden from prying eyes, as if they shared a secret no else had right to know, something deeply private. And then when Junko ever so slowly moved her hand towards his and after the briefest moment of hesitation covered their joined hands with hers, it’s as if she was both giving him assurance and also making sure that he wouldn’t let go! I find it fitting that the episode concludes with Takane standing next to Junko and smiling so much because the main story of the whole episode comes full circle as Junko really sees for the first time that he is indeed smiling much more when he is around her, that he is not so reserved and cold as she used to think. It feels so omious that when Takane smiles the brightest the scene intersects with his grandmother annoucing to his younger brother that Takane is no longer worthy to be the head of the temple. It basically means she doesn’t like the real Takane, the smiling and happy Takane. It’s interesting really because when people say you changed it’s usually because you are no longer the person they want you to be. The fact that it’s his own family who speaks about him like this and who has become his greatest enemy and that it is not some strangers and it’s in fact the strangers who show more acceptance of who he is than his own family, reveals the real tragedy of Takane’s life. @fidda868, This almost kissing is driving me crazy. Even though you said there was no kiss in the last ep, I still found myself acting all delulu, talking to the screen at the end of 7 " yayy a kiss' and then back to reality. I'm just in love with this couple. They are the hottest OTP, their chemistry is just off the chains. As much I'm just dying (please mr/ms writer make it so) to finally see them kiss, I'm really looking forward to seeing Junko go all jealous over the lipstick stain. They are so adorable. I have a feeling that's just going to be epic. @briseis, I can't thank you enough for you recaps and commentary for this drama. I'm now checking out your blog on tumblr the moment I get online. You are truly a life saver for this obsessed fan. @briseis thank you for screencapture and review for ep 8 preview. Cant wait for watching Takane without his monk appareal. Finally I've watched ep 7 raw. Seriously, this drama keeps redefining perfection with each new episodebut let’s begin with the bad news first - 5→9 will end with 10 episodes. I’ve seen a scan of a TV program article on Twitter today which stated that the final episode is going to air on 14.12. So you can mark the date in your calendar and book yourself into the nearest detox facility, because it’s the day this awesome drama will leave our lives for good and a withrawal syndrome of epic proportions will be imminent. I have no idea what I’m going to do - perhaps you have already noticed that my life revolves around this show and I pretty much plan my week according to it! We need that 11th episode! I admit in comparison to most jdrama rom-com where the OTP actually gets together only in the final moments of the last episode we are light years ahead, but I want to see more of this epic OTP! Even teh ratings are strong - the show has never fallen below the 10% mark (episode 7 recorded the 2nd strongest rating - 12,6%) and this is the most succesful rom-com Fuji TV had since RMPW, and if 5→9 will continue like this it will equal RMPW’s ratings. It’s obvious Junko knows she fancies him but is still in denial how deep her feelings for Takane really are, and is basically looking for excuses. Finally, in typical Junko fashion she decides to run away - she is going to the US, she reminds herself she already saved so much for it (on transport, food,…) - I find it symbolic and fitting because it’s been something she’s been doing the whole drama long, being afraid of facing her problems and rather avoding them or downright running from them; it’s something that changes in this episode and it’s been Takane who has inspired this in her with his love and devotion. Afterwards, she gives herself a pep talk “game face on” which I’m pretty sure is a hilarious meta on Gokusen and off she goes to eat breakfast. Well, as a living reminder that it wasn’t a dream Junko finds the very man she was actually dreaming and fantasizing about sitting in the living room with her family (well, why so shocked Junko, it’s breakfast time and you know that Takane is always punctual for breakfast!) and he is pretty sure it wasn’t a dream and confirms it to her (he is so happy that he is finally going to marry her! LOL!). If it wasn’t enough her family congratulates her for her upcoming wedding with Takane who came to the conclusion that it’s done deal because Junko held his hand. To Junko’s aghast shock he’s already commenced with the wedding preparations. His first step? Printing the invitations, to be more precise - Takane proudly presents 2000 of them! OMFG! THEY LOOK LIKE COUPLE AUTOGRAPH POSTCARDS! WHEN CAN I GET ONE OF THOSE! Forget about subtlety, elegance, doves and gold italic handwriting, for Takane only a bold writing, pink heart and one big couple picture will do, and of course, he’s chosen the picture where Junko has her hands behind her back and holding his own hands with them! Marrying Takane has one huge advantage - you don’t need a wedding planner - this man loves to plan so when it turns out that Nene will be celebrating her 17th birthday on 23.11, he enthusiatically offers to organize the whole thing! I bet there will be a schedule! @ororomunroe Thank you for starting this thread. Love the two leads here. 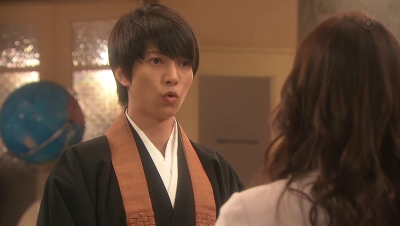 Yamapi is seriously adorable as the hopeless romantic monk. I wish the series would go on a bit longer. Love the female lead in Dear Sister too. Cried buckets in that drama. OMG I just found out this thread existed! 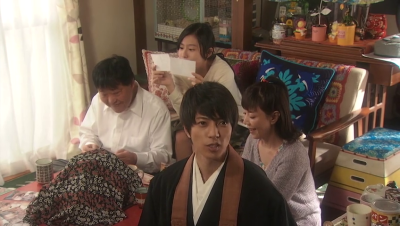 I don't watch a lot of J-dramas, but started this drama when I saw Ishihara Satomi was in it - I liked her since RMPW. 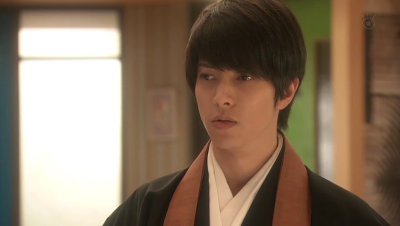 BUT as I binged watched from Ep 1 a few days ago, I fell in love with Yamapi's character too and now I'm crazily addicted to this drama. *sobs* Why do J-dramas only air once a week??! I can't wait for Takane to get his first kiss from Junko! Their first kiss has been thwarted so many times, no wonder Takane always has to go for a cold shower under the waterfall lol. OMG! HE REALLY COUNTED THEM! EPIC! Have I already mentioned how much I love Takane?! I have my personal TOP10 list of favourite Asian male leads which is a very exclusive company but Takane is attacking the TOP5 right now. Junko argues that there are 365 days a year - she means that it would mean that they would celebrate an anniversary basically every second day - but he completely misunderstands her meaning and ASSURES her that she doesn’t need to worry that they will subdivide the anniversaries (in order to cover each day of the year!)! How awesome it is that he is indirectly saying that each moment which he spends with her is worthy to celebrate and commemorate?! Junko calls it Hoshikawa’s World and I WANT TO LIVE IN IT! Then it is time for breakfast and Takane immediately starts serving Junko with rice and miso just as it’s expected from a devoted future husband. But in truth there is nothing “just as expected about it” particularly in Japan. I already addressed this in one of my previous posts, but this is really a complete role reversal, basically challenging the whole idea how men and women are viewed and depicted in Asian dramas and in East Asian society in general, where it is the woman who takes care of the hearth and family, yet here we have Takane who is perhaps much more suited for it, a man who enjoys it and enjoys taking care of the needs of his loved ones. I’ve always found Takane to be a strange mix of the old and the modern - on one hand he keeps the traditions but he isn’t afraid to break the rules and reject the dogmas and I would even go so far as calling him a feminist because he doesn’t discriminate and it doesn’t matter whether it is gender or social status. And with Junko, who despite her modernity is very loyal to her family, they create this amazing symbiosis. Later, Amane comes looking for Junko and everyone is afraid of him, they even contemplate whether it wouldn’t be wise to call security. When he meets Junko he compliments her on her beauty but in the same breath he deregatoryly adds that it’s kind of ordinary. When he reaches out to touch her face Takane stops his hand and introduces him as his younger brother. Later he tells Junko that Amane left to study/train in Kyoto when he was 14 and when she asks him why he suddenly returned Takane has no idea but is clearly suspicious. For Takane Christmas is really all about cuddling and holding hands, isn’t it? Perhaps converting to Buddhism isn’t such a bad idea after all. Anyway, why do I have a sneaking suspicion that if ELA kept grades of their students Takane would come on top, making his teacher proud? LOL! That adorable classroom nerd! I mean he holds up both of his hands and threatens his fellows classmates if they dare to challenge him on his Christmas knowledge! I love these little snippets where he keeps trying to monopolize Junko’s attention and she is trying so hard to ignore him because she is afraid he would notice she likes him (and also what teacher likes it when her student knows about the subject more than herself?!). But Takane has had enough of this unfair treatment and after the lessone ends he calls her on her cold attitude towards him compared to the other students after - it’s so cute how jealous he is because she showers praise at everyone for trivia information even a 5 year-old would know, but she barely acknowledges him after his Todai level of knowledge. By the way, I loveed the little pat on the shoulder he gave here to catch her attention because it’s in direct contrast to the scene in episode 1 where he caught her arm and wanted to drive her home - he is no longer unsure and he feels completely comfortable with their physical proximity. Suddenly, Nene arrives to talk about her birthday party with Hachiya and Yuki which Junko doesn’t want to allow reminding her what happened last time, however, Hachiya argues that this time he will take care of everything and that there is nothing to worry about. However, it looks like it won’t be neccesary because Takane has appointed himself as the official organizator of Nene’s birthday! I KNEW IT - THERE IS A SCHEDULE! He’s booked a fancy hotel in Ginza and invited the likes of Lady Gaga and Avril Lavigne (whose manager turns out to be a parashioner of his temple) to perform! How rich is he actually?! Considering he owns a private jet he must be on the zaibatsu/chaebol level! How does he even find the time to plan all of this next to his monk responsibilities and stalking Junko?! Does he even sleep?! Junko argues that the scale is too big, but Takane protests that 17th birthday are once-in-a-lifetime experience. Junko says it feels more like a music festival with so many artists but Takane, the megalomaniac he is, misunderstands her again just like in the morning and ASSURES HER that when it will be her birthday this time they will hold a really large-scale celebration! He ruminates that he could reserve Budokan for her birthday but it seems a 15 000-seat arena is a little too small for his taste so it would be better to do it in Tokyo Dome (55 000 seats!) over the course of 5 days, basically turning her birthday into a tour!!! OMG, I laugh so much everytime I watch this scene because it’s so freaking hilarious. Subs are out for episode 6!